Interested in learning more about your ancestors, but don't know where or how to begin? Afraid of what you might find if you go barking up the family tree? Any skeletons in your family's closet? Stumped about how you're really related to Cousin Harold? If you answered yes to any of these questions, you might want to join genealogist Nikki Chowning as she explains these topics and more in Genealogy 101, a free, six-week course held at the Scott County Public Library in Georgetown, beginning on April 4, 2019. Among the topics Chowning will cover in the course are documenting family groups, extracting information from U.S. Censuses, the value of local newspaper articles and obituaries, and searching court records. She will cover immigration records and resources, and provide handouts containing links to valuable online content. The course winds up with a class devoted to Internet research. Genealogy 101 is an excellent first course in exploring your ancestry, or a timely review for those already familiar with genealogical research. Genealogy 101 will be held on six consecutive nights beginning on April 4,2019. Classes will be held in the Scott County Public Library, 104 South Bradford Lane, in Georgetown. To register for the course, call the Library at (502) 863-3566. Nancy Giles taught a previous class of Genealogy 101 which began with an overview of genealogy and how to get started documenting a family history. 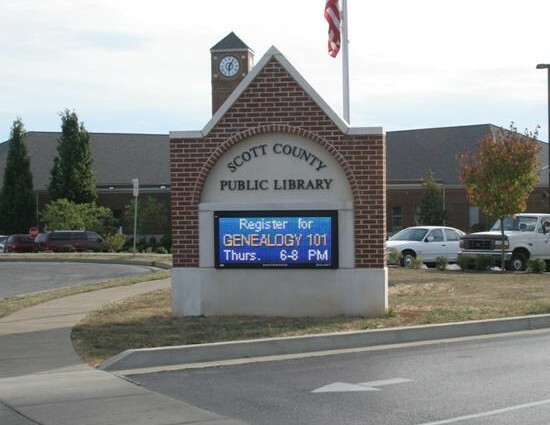 The Scott County Public Library announced a recent Genealogy 101 class.